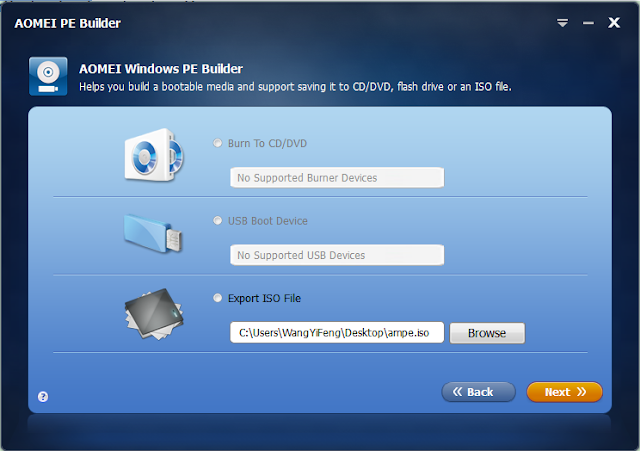 AOMEI PE Builder is a software to create a bootable environment based on Windows preinstallation environment, the bootable media can be of many kinds: export ISO file, CD, DVD, USB flash drive. AOMEI PE Builder is an enhanced Win PE. To use it, you don’t need installing either AIK/WAIK or Windows installation disc. It brakes the limitation of original Windows PE and saves your time. Comparing to the traditional Win PE, AOMEI PE Builder could create a visual environment which is familiar to Windows 7 explorer, there are start menu and task bar in it. At first, AOMEI has a bootable creator in AOMEI Partition Assistant and AOMEI Backupper. Now AOMEI PE Builder is a single tool and gives you more choices. AOMEI PE Builder is the third software product developed by AOMEI technology. It is a freeware, you can download it from AOMEI official site and big download sites like CNET. Its theme is similar to AOMEI Backupper - deep blue GUI, clear interface and yellow button. Install and run it. The main interface is a preface. There are welcome words, instructions, and hyperlinks. Read and click Next to continue. Normally, the second interface detects and said your system supports the creating bootable media, just click Next again. By the way, AOMEI PE Builder supported operating systems are Windows 7, Windows 8/8.1 and Windows Server 2008R2/2012. The third step is an important step. 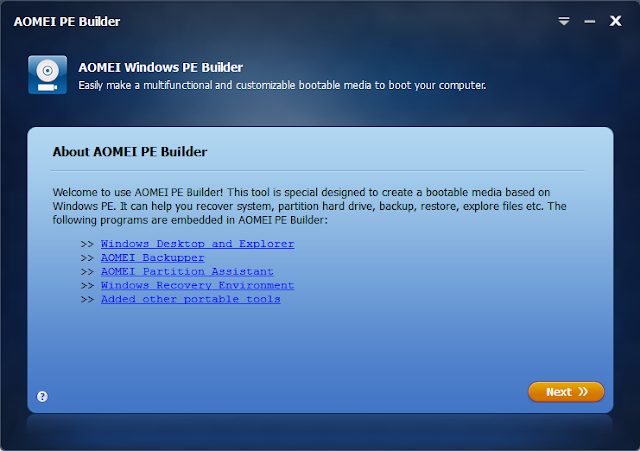 You are able to add some AOMEI PE Builder built-in utilities into the bootable media and then you may use them in the environment. 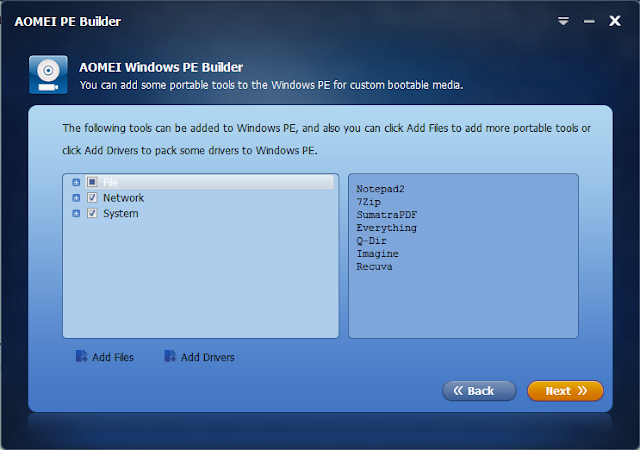 Except for these integrated apps, AOMEI PE Builder allows you to add more portable tools and drivers to pack some drivers to Windows PE by click Add Files, Add Drivers separately. Free partition manager - Standard Edition of AOMEI Partition Assistant and AOMEI Backupper Standard is default in it, you don’t need to add them additionally. The fourth step is a key step too. Here, decide which media to build. From top to bottom, the order is Burn to CD/DVD, USB Boot Device, Export ISO File. Click Next this time will start the process of creating. Wait a minute, you can get your customized Windows PE bootable media. AOMEI PE Builder has many uses. When you can’t enter Windows successfully, you can enter the environment to fix errors, antivirus, recover the system and so on. It is necessary for us to create a bootable media in advance to protect our data and solve trouble in need.